Click on a Watch link to watch a past webinar in your web-browser (Adobe Flash required). To download a past webinar, right-click on the Download link and choose "Save link as..." to save it to your computer. All webinars are in .mp4 format and are viewable by Windows Media Player, iTunes, and most other media players. Here is a free program that will play the downloaded webinars. We've got two more webinar sessions to go -- tonight and tomorrow night. Ol' Myrt here thinks you will agree some mighty interest discussions have come out of these sessions. 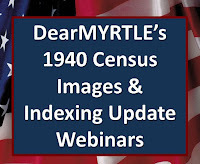 The 1940 Census webinar sessions are being held every night this week (April 2-6, 2012), and you may attend any or all of the sessions with your single registration. Register once to receive log-in info and reminders for all remaining nights. You can sign up at https://www3.gotomeeting.com/register/515167334. Ol' Myrt here will start the pre-webinar warm-up at 5:45pm Pacific US time, and the webinar itself begins at 6pm. Arrive early to be assured of a seat. Special thanks to RootsMagic.com for providing the larger webinar "room".